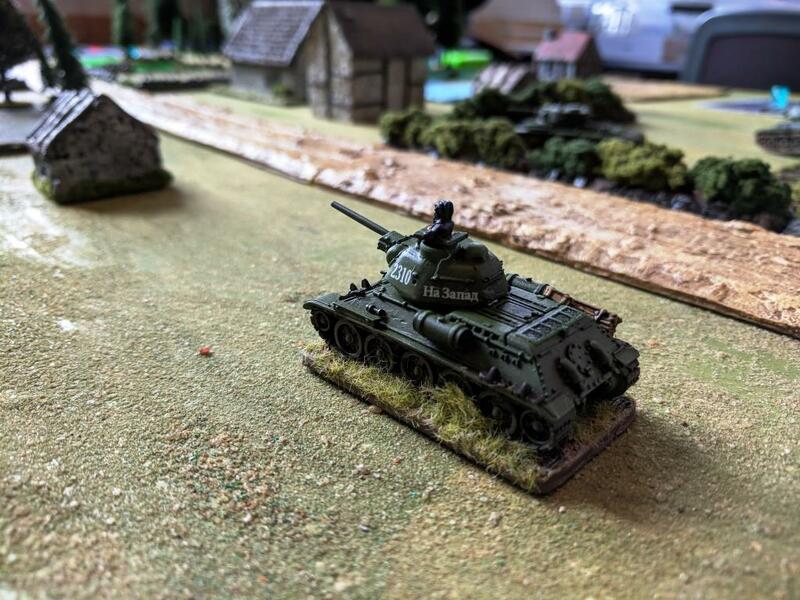 Gratifyingly, because often I find I paint things and they lie unused for months, I was able to use some of my newly painted Soviet armour the day after I’d finished it, in my very first game of What a Tanker, at the League of Ancients. 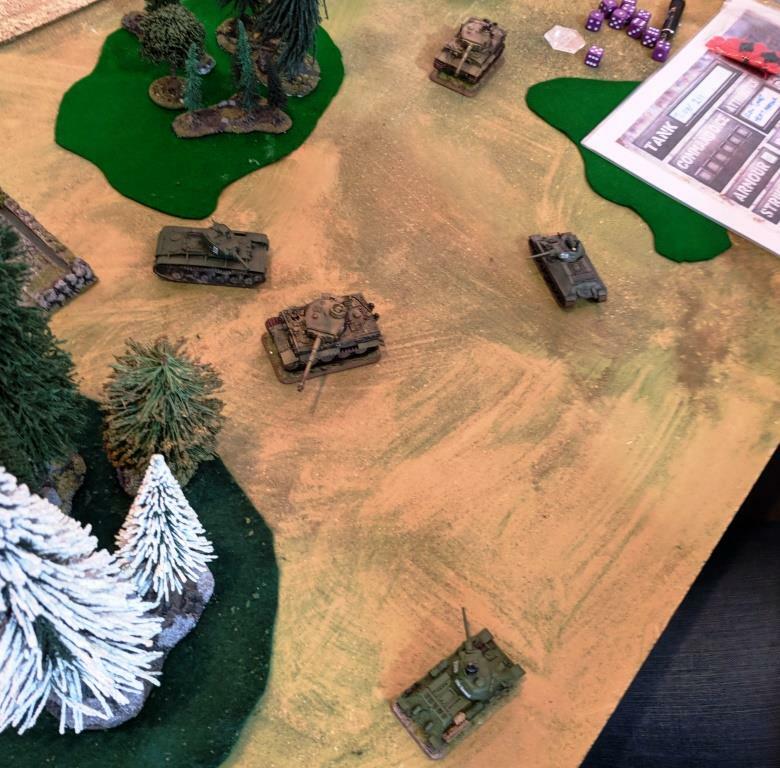 Because we started off with an odd number of players, we worked out a game where a larger number of Soviet tanks (two T-34s commanded by Noah and I, and a KV-1s commanded by Victor) took on a pair of Tigers commanded by Scott and Chip. The scenario we rolled was Long Ball, so we were playing the length of the table, and we rolled Heavy terrain. 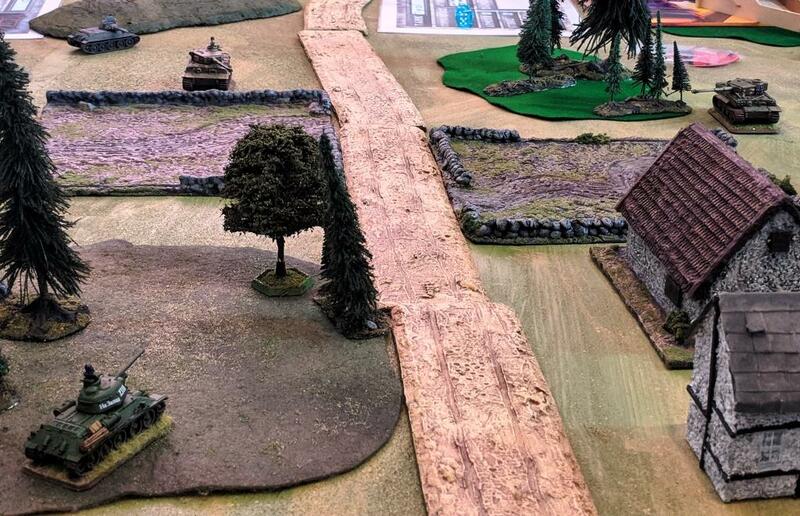 The terrain made the game into a pretty disjointed affair. Neither side was able to consolidate their forces until quite late in the piece. We pretty soon discovered that our 76mm guns stood next to no chance of hurting the Tigers much from the front or sides. Chip takes time out from admiring the somewhat distracting view out the window to line up a shot on Victor’s KV. I scored a good hit on Scott’s Tiger, rattling the crew, and made a break for it, attempting to get around behind him. Unfortunately my line of advance was out by a few inches or degrees, and my left rear corner was still in Scott’s line of sight when his turn came around. My tank crew were immolated for their error. 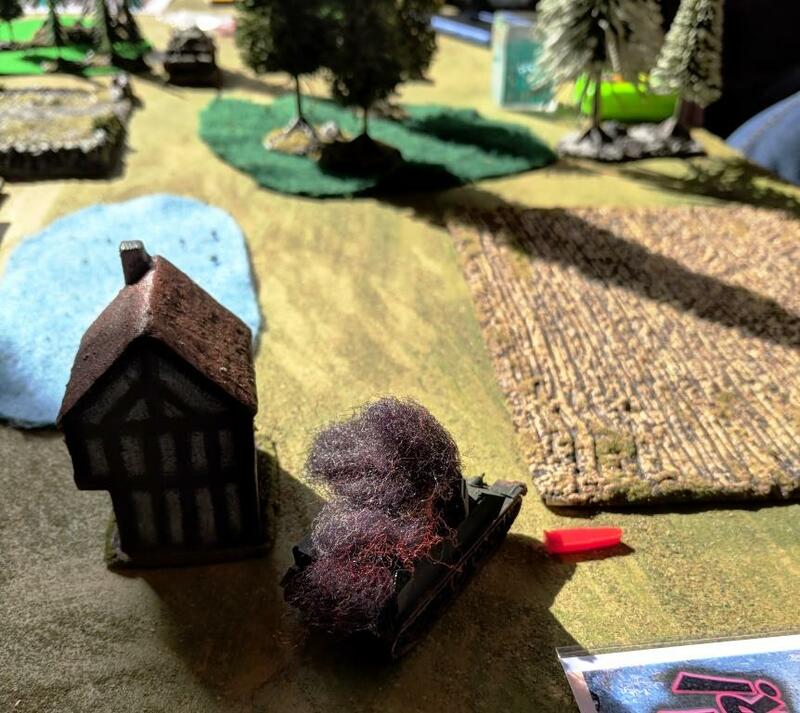 Meanwhile Noah used covering terrain to sneak up on Chip, while Oli brought his tank up in support and Victor tried to persuade his crew to do anything other than draw fire. 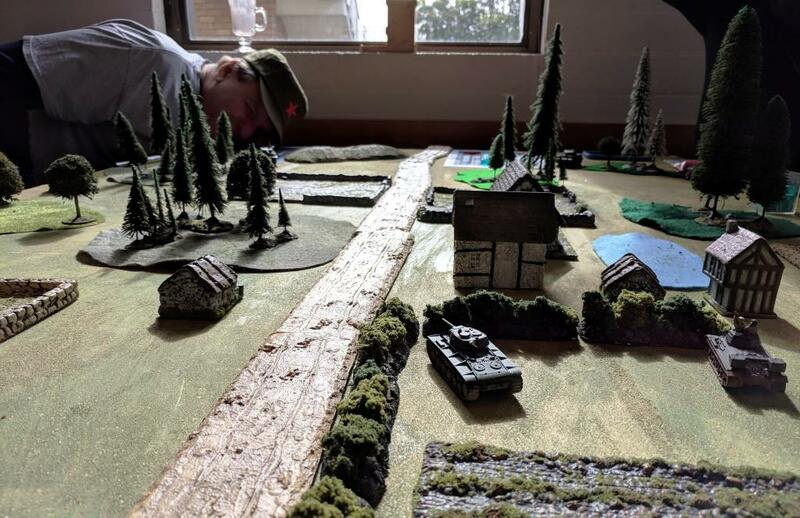 The Soviets begin putting something together. Noah did a splendid job of racing around shooting up first Chip’s and then Scott’s tanks from the rear. But despite all those rear shots, the Tigers refused to die. We began running out of time, which was a shame because it looked like we were heading for an explosive ending. Quite a melee was developing when we had to end the game. It was a fun and involving game. The points system worked as well as any, it’s pretty simplistic but trying to smooth out what happens when T-34s meet Tigers would make it very complex. When we’re pulling out vehicles we’ll just have to make sure that the quality difference isn’t too great in what we choose. One interesting effect of the quality difference (and maybe my demonstration) was that we Soviets took ages to work our turns out, mindful that it was game over if we made a mistake. But another factor was that many of us were beginners. That’s a credit to the game’s simplicity :- that a number of players can have never played that game before but it still worked.